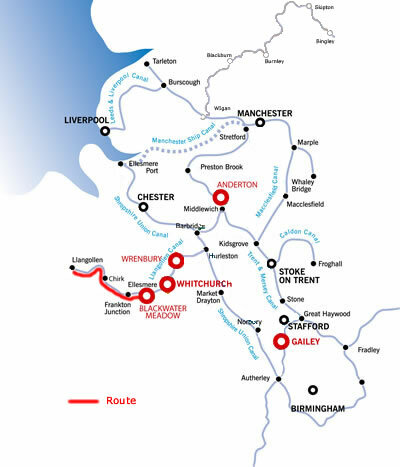 In a weekend you can cruise over the famous and breathtaking aqueducts at Chirk and Pontcysyllte -a World Heritage Site, called 'the stream in the sky', to the delightful Welsh town of Llangollen, seeped in myth and legend and with the River Dee thundering through the centre. The surrounding scenery is beautiful with the Welsh hills, and the Dee valley. Llangollen hosts the Llangollen International Musical Eisteddfod every July which brings in some 120,000 visitors and turns the town into a vibrant international stage. Also of interest is the Llangollen steam railway, there are 7.5 miles of track on which you can take a steam train trip. Turn right out of the marina and pass the Ellesmere branch, take the left fork. This part of the Canal is very rural, and all you will see is fields full of cows and sheep. You will presently pass the junction with the Montgomery Canal on your left, 7 miles of this is navigable, up to Maesbury, and if you want to cruise along here you have to book with the Lock keeper the day before. (Ask at Blackwater reception before you leave). If you have made good headway, you may want to spend your 1st Night here. The next day head towards Chirk. The areas main visitor attraction is Chirk castle (NT), a magnificent 700 year old fortress built by Edward the 1. As you pass Chirk marina on your left there is a Golf Course and driving range. If you want to build up your nerve before crossing the Pontcysyllte Aqueduct, you can stop at Froncysyllte , there are 2 pubs, the Britannia Inn and the Aqueduct Inn. You immediately come into Trevor Wharf, which might be a bit congested if boats are queueing to go over the aqueduct, but you ignore them & turn a sharp left towards Llangollen, unless you want to use some of the facilities at Trevor Wharf, water, pump out, chandlery shop etc. You will encounter shallow water & narrow sections of canal between here & Llangollen, in some cases down to single file. Be careful all along the Canal about going too close to the sides, as in some cases it is shallow & you may get stuck, in which case you will need to reverse & use your pole to push yourself away from the bank, or jump out and push off. 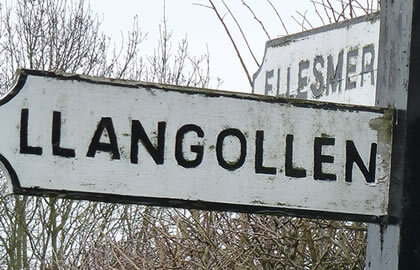 It takes about 3 hours to navigate to Llangollen, and requires a bit of concentration & some reversing, but it is well worth it. It is very pretty hilly countryside, but have your first mate & other shipmates handy, in case they need to jump off & hold the boat steady by the ropes whilst you pull in & let other boats pass, its all part of the adventure. You pass by another pub at bridge 41, the Sun Trevor, in case you are in need of some refreshment. When the sun is shining, you can think to yourself that there is no better place to be than amongst the Welsh hills & valleys. As you plod on towards Llangollen, you will see the mysterious ruins of Dinas Bran castle on top of a very steep hill, and you know that you are not far away now. However you have the narrowest bit to negotiate now, all single file traffic with just a few passing places. You will need to send a runner ahead to see if it is OK to proceed. You eventually emerge into Llangollen and if the ticket office is open you can purchase a ticket for about £7 to moor overnight in the Canal basin, or there are some moorings on the left where you can tie up for a few hours. If the ticket office is closed, just purchase a ticket when it reopens. The Canal basin has electric hook up & water, so you can connect yourself to the mains & do some sightseeing for a day or so. It is 5.75 hours cruising to here from Hindford Bridge. Llangollen is very pretty, with the River Dee cascading through the town, with lots of white water crashing through the rocky river bed. If you are lucky you will see the steam engines as you walk into the town, at the Llangollen Steam railway, and it is well worth having a ride on one. It will take you to Carrog & back, some 8 miles of some of the most stunning scenery in Britain. There are many craft & souvenir shops & even some selling gorgeous chocolate & fudge, plus cafes, bars, tearooms & restaurants. If you tire of Llangollen & want some exercise after being on a boat for a few days, take a walk to the beautiful Horseshoe falls, just a couple of miles along the towpath to the end of the canal. On the way back stop off for a pub lunch at the Chainbridge Hotel, where you can enjoy spectacular views of the River Dee beside you. You can take a detour near here as just off the A542 is the ruins of the beautiful Valle Crucis Abbey, one of the most complete Cistercian abbeys in Wales. Then getting back on the towpath again, you pass a very quaint Canal & motor Museum, which is worth a look. Back in Llangollen there is more to see & do, including Plas Newydd, an 18th century house open to the public, which now houses a museum and steam train rides go from Llangollen Station with 7.5 mile of track. You now start cruising east back the way you came to Ellesmere. It is 8 hours cruising back to Ellesmere, if you have time, sample one of Ellesmere's delightful pubs or restaurants for the evening. Ellesmere is a busy 18th century market town.